The B&B Casa dell Ammiraglio has three large linking bedrooms, one of them with marriage bed, the other with separable double bed. 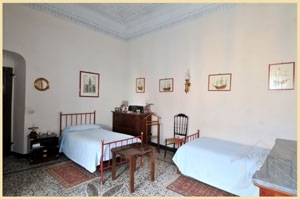 The living room, which can be used also as bedroom, is separated from the others by a floor and can be arrived at from the entrance hall, which is decorated with antique furniture and paintings. In our guest bathrooms you will find a multi-function shower and all the other necessary sanitary facilities. 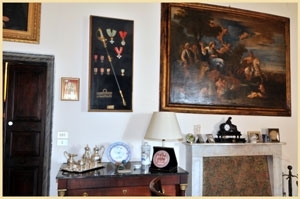 Breakfast can be arranged in the traditional, Genoese kitchen, or otherwise in the dining room. The ceilings of all the rooms are decorated with beautiful frescos; the most particular one is the ceiling of the dining room. The enormous antique staircase leads to the entrance of the apartment. The master bedroom is equipped with an air conditioner; the second bedroom has a mobile air conditioning apparatus which can deserve also the living room. You can discover the building already named in maps of the 15th century. It was the dowry of Cavaliere Fabio Marengos in the occasion of his daughter Olivas’ wedding with the upcoming admiral Gerolamo Bollo. Already in this period the second floor of the building was used for the accommodation of friends in the summertime. 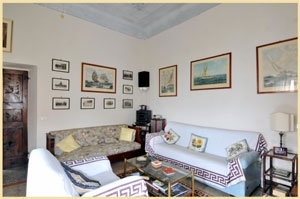 This means that our B&B carries on this historical tradition of hospitality. Private Garage suitable only for one little car: parking to be reserved in advance.